ODEM’s mission is to make quality education accessible and affordable for everyone. ODEM, which stands for the On-Demand Education Marketplace, provides a platform built on top of Ethereum where educators and students can interact directly in a decentralized marketplace. ODEM takes the position that the current university model is flawed, unable to provide the skills students need upon graduation and at a cost that enables these educational opportunities only to the most elite. In addition, students today often are required to learn skills in real-time as they become relevant to their career, a service that traditional university degrees do not yet provide. 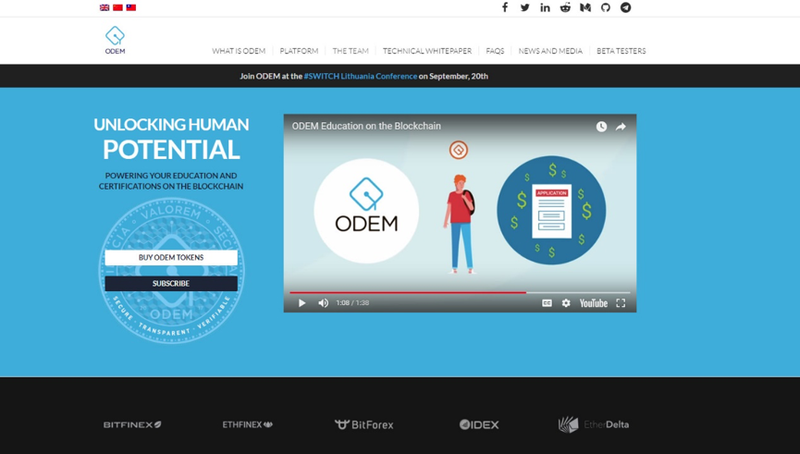 The idea behind ODEM is that it provides a platform based on blockchain technology and smart contracts in which students can purchase courses and lectures tailored to their professional needs without the need for an intermediary. ODEM’s CEO, Richard Maaghul, has more than 20 years of experience in early-stage funding, startup development, and internet solutions, including previous experience as the cofounder of Excelorators Inc. Bill Bayrd, the Chief Token Officer, was also previously a founder of Excelorators Inc and served in the US Marine Corps Reserve. Michael Zargham, the Chief Systems Engineer, has a Ph.D in electrical and systems engineering from the University of Pennsylvania. 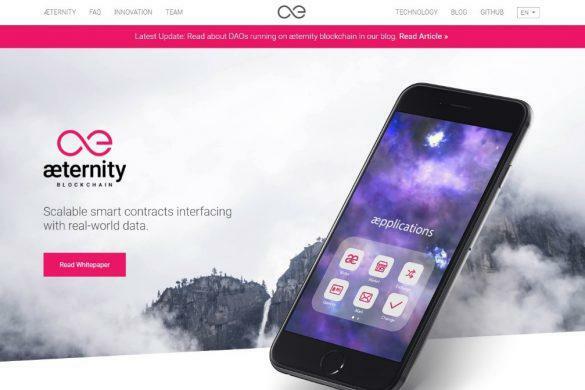 He is also the founder of BlockScience, a technology research and analytics firm specializing in the design and evaluation of decentralized economic systems. ODEM partnered with Excelorators Inc to provide high-quality education to the masses. The company is a network of more than 200 professors at top universities that has been a leading provider of education to overseas students, executives and managers desiring from America’s elite universities. The beta testing of the platform in conjunction with Excelorators Inc was launched on July 2 of this year. The Excelorator partnership brings significant contacts throughout the US educational landscape, an understanding of how to deliver success educational experience to students around the globe, and the ability to quickly resolve cross-border payment issues. By using the ODEM platform, Excelorators estimates that it will be able to reduce the cost of the educational programs that it currently provides. ODEM had an ICO from February 17th to March 18th, 2018 and launched its token at a price of $0.06. 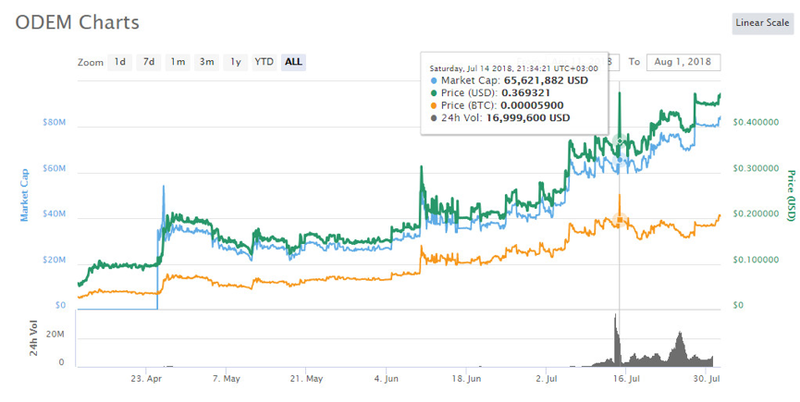 It rose to $0.27 on June 10 and again to $0.369 on July. At the moment the token price is currently trending upwards. ODEM was one of the last tokens to be listed on Bitfinex. 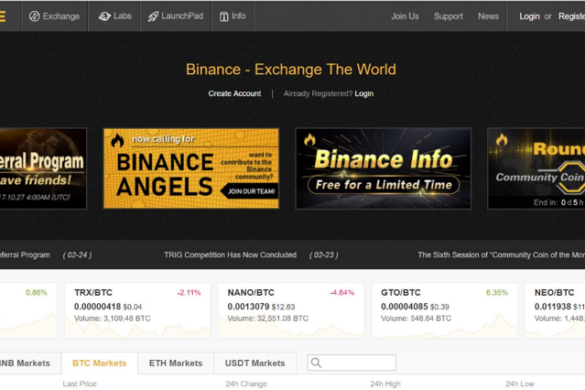 New cryptocurrencies are now listed on Ethfinex. The ODEM technology works with the collaboration of students, sponsors, and educators, who either register for or develop a course or lecture. Both educators and students commit to offers by staking the ODEM token. Upon completion of the program or course, students receive a digital certificate, the staked tokens are returned to the students, sponsors or educators, and the transaction is settled. Digital certificates are added to the blockchain, enabling educators to build their professional reputation and career visibility accordingly. 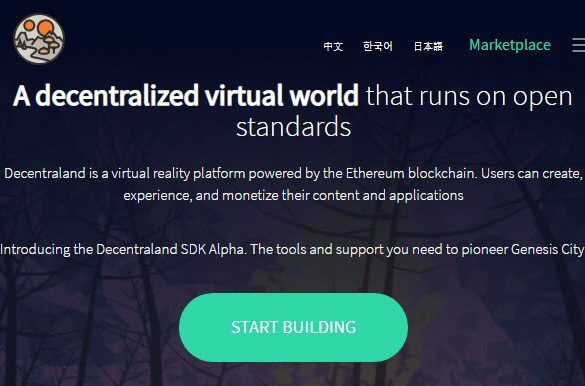 In the future the platform aims to provide Education Skill Badges for coursework on subjects such as computer repair, programming or 3-D printer operation. Educational Program Token Staking – Learning Seat – This component rewards commitments of students and educators alike. Digital certification – These digital certificates can either function as committing tokens to the blockchain, creating proof of participation and completion of programs on the network for both students and educators, and create a digital record of proof of completion through other traditional institutions or certification programs. Education Activity Repository Process (EAR) – The EAR process securely stores individual’s institutional records. Students post their educational transactions, staking the ODEM token when committing to a course. Once their commitment is fulfilled, the tokens are returned. 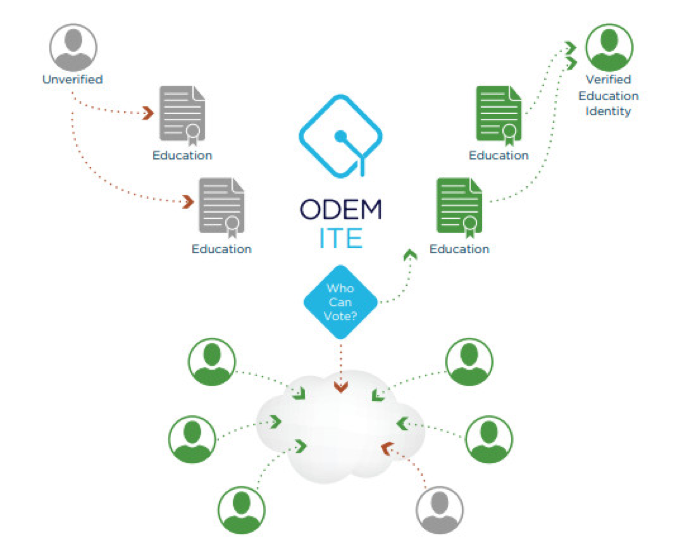 Identity Through Education (ITE) Process – When students cannot verify academic transactions, ODEM will communicate with established entities to verify them through a consensus model. Students and private institutions alike can then pay a fee to post certificates on the blockchain. Window Seat – Viewing Certificates – This component allows both employers, universities, students, educators, service providers and third-party stakers access to secure data. Secure data includes digital certificates, completion rates, and program activities. Window seat access can be obtained through the ODEM tokens. Curriculum Royalty Payment Integration – Educators can license their coursework to other educators, earning royalties while doing so. Revenue Sharing Contracts – ODEM will use smart contracts so that it takes advantage of all types of current and future business relationships. ODEM Token Self-Locking – Participants can request a certain number of tokens to be locked through their digital currency wallet access. Staking providers – These actors can either manually stake tokens for users or use them to commit to program offerings. ODEM also provides the ability for students that are financially and physically disadvantaged to be sponsored. Sponsorship can include financial assistance for the educational courses, program or expenses. Sponsors can specify the type of student they wish to support, whether according to income, age, gender, or academic achievement. The ODEM platform is powered by smart contracts and the ODEM token, which can be bought and sold using the ODEM Wallet. The ODEM Wallet has no transaction fees so that educators will receive 100% of the fee paid by the students. Educators will be continuously verified through the use of artificial intelligence with its Independent Credentialing Verification (ICV) process. This process will seek to remove barriers that currently exist in brining credentials across borders, allowing workers to receive the greatest professional and financial awards for the education anywhere in the world. ODEM’s tokens are a utility token used to facilitate smart contracts which commit students and educators to academic programs. Students or educators who desire to enroll in or provide a course program must stake their tokens and are otherwise known as staking providers. 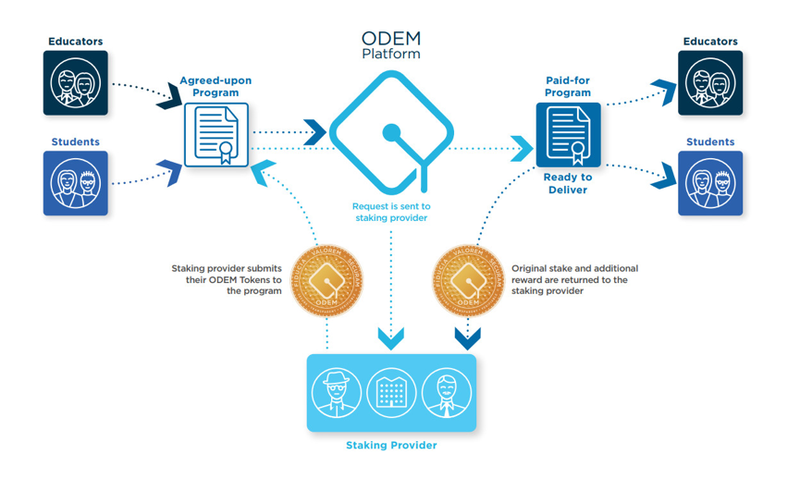 Staking providers can be rewarded a 50% of ODEM’s fees for using the ODEM platform and are also given back the staked tokens after the completion of the coursework. Tokens will be awarded quarterly to users. Students and educators who do not fulfil commitments will be penalized in order to minimize irresponsible behaviour. The main exchange for purchasing ODEM is on BitForex, which currently has the largest volume of the currency. ODEM can be traded on BitForex for ETH and USDT. At the moment the current daily volume of ODEM traded on BitForex is over $9 million. ODEM can be stored in any wallet that supports ERC-20 tokens such as Coinomi, MetaMask and MyEtherWallet. For maximum security, however, you should store your ODEM on hardware wallets such as Ledger Nano S.
ODEM has outlined its development timetable in great detail in their whitepaper. 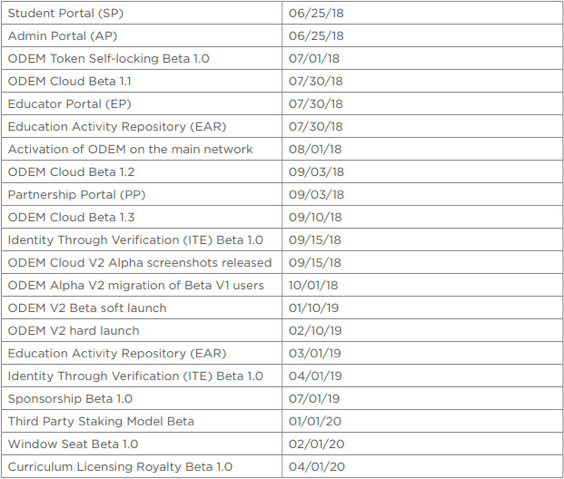 Upcoming goals include activation of ODEM on the main network, the Partnership Portal, ODEM Cloud Betas, and Identity Through Verification (ITE) beta. The ODEM Cloud is the proprietary interface and first application that will run on the ODEM network. 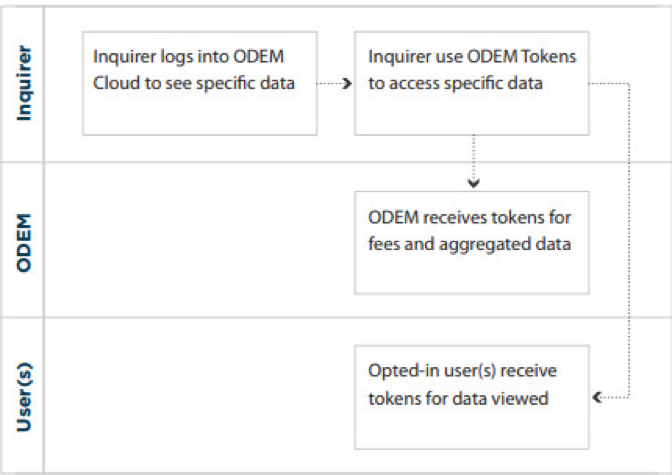 Services provided by the ODEM Cloud include staking tokens, sponsorships, and the ability to view the different educational programs available.